Welcome to Our Mountain Bike Masters Program! The SMA Mountain Bike Masters Program is designed for campers who love to mountain bike and want to ride world-class single track trails every day. Each summer we ride some of the best trails on the East Coast: the Allegrippis Trails at Raystown Lake and the trails in Rothrock State Forest. The thrill of mountain biking is unique, and that’s why we keep chasing it! Campers in the Mountain Bike Masters program will ride every morning and then choose from other activities in the afternoon. Riding with other teens who are as excited about biking as you are is an incredible feeling! If you’re passionate about mountain biking and want to improve your skills while having fun, you will LOVE our Mountain Bike Masters program! The foundation of our Mountain Bike Masters program is fun, with a healthy dose of skill improvement. Our staff starts by evaluating campers’ riding strengths and identifying areas of improvement. Our instructors take the time to teach both basic and advanced riding skills, such as the proper attack position for every situation, braking, cornering, building speed through rollers, and more. 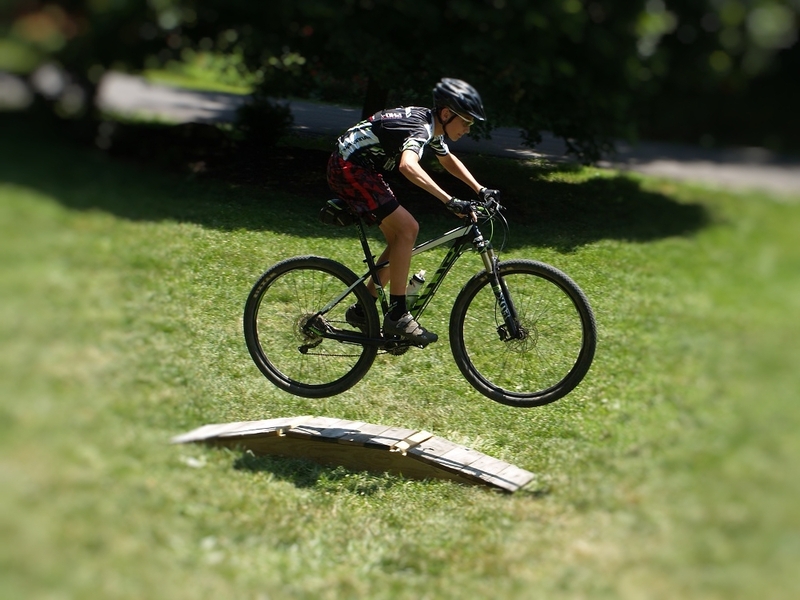 Besides creating this learning environment, the Mountain Bike Masters program provides campers the opportunity to practice these techniques on the trail and at the skills park. Mature, knowledgeable, and fun camp counselors are the backbone of our camp and especially of our Mountain Bike Masters program. Our experienced staff evaluates riders and teach a range of riding techniques to help campers take their biking to the next level! Keeping campers safe is always our number one priority, and teaching campers to keep themselves safe by keeping control of the bike is an integral part of our program. Of course, our staff is also there to lead by example, motivating campers to push themselves and stretch their comfort zones while maintaining safety at all times. 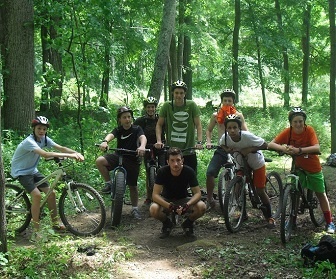 Each session, campers in the Mountain Bike Masters program have the opportunity to go on a mountain biking overnight! We’ll pack up our biking and camping gear and travel to nearby Susquehannock Campground at Raystown Lake. 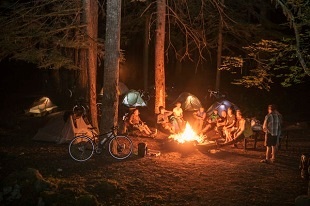 This gives us the chance to ride the nearby Allegrippis Trails all day and then cool off with a swim in the lake before gathering around the campfire for stories and s’mores! It’s no wonder campers consistently point to these overnights as standout experiences at Stone Mountain Adventures. The Mountain Bike Masters program is ideal for campers who are excited about improving their skills on world-class single track trails on a daily basis. 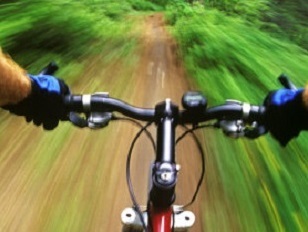 Campers are welcome to bring their own bikes or ride one of ours, purchased locally from Rothrock Outfitters. The Mountain Bike Masters program is open to campers of all skill levels, provided they feel comfortable riding single track trails. To ensure quality of instruction and maximum attention from our staff, this program is limited to six campers per session. Please note that campers not enrolled in the Mountain Bike Masters program will get ample time to mountain bike during their time at Stone Mountain Adventures. Access to top quality instructors and world class trails make SMA one of the best mountain biking camps for teens! In May 2009, Raystown Lake opened their Allegrippis Trail System to the public, though the project had been in the works since 2003. And while a variety of outdoor enthusiasts enjoy the newly-created trails in Hesston, Pa., the 30-plus miles of singletrack were designed by mountain bikers and built by the International Mountain Bicycling Association. Described by many as part pump track, part mountain bike trail, the Allegrippis trail system is machine built and organized in a "stacked loop" format-meaning riders can tailor the distance and difficulty of their ride. Small, easy loops are located close to trailheads and longer, more difficult loops spur from the easily-accessible trails. Endless combinations of routes can be ridden-both short and long. Obstacles are few and far between on the Allegrippis trail system, a rarity in Central Pennsylvania, which is known for its rocky terrain. Beginners will enjoy the smooth trails and lack of demanding climbs. More advanced riders can simply pick up the pace for a fast, rhythmic ride on the rolling trails. What the Allegrippis trails lack in technical features, they make up for in well-designed and well-marked sustainable trails. Although they're rated easiest,moderate and most difficult, mountain bikers of any level could safely ride all 30 miles of trails—just watch your speed! Riding this trail system is so fun, it's easy to lose track of time. But every once in a while, don't forget to stop and take in the scenery! Many of the Allegrippis trails overlook the sizeable and stunning Raystown Lake. Access the Allegrippis Trails at trailheads along Seven Points Road just past the Seven Points entrance and on Bakers Hollow Road right before the Susquehannock Campground entrance. Here's what Robert Pell has to say about the trails in the "Assault in the Allegrippis" description. 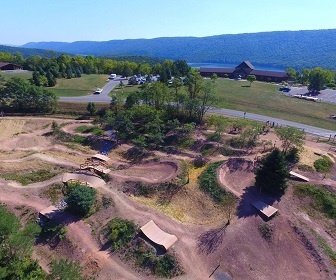 "The Allegrippis Trails at Raystown Lake are some of the best trails on the east coast. The trails are buttery smooth and flow like a pump track through the forest surrounding the high-mountain lake. The trails are easy enough for your grandmother to ride but when you let off the brakes they become an adrenaline pumping roller coaster where your wheels are in the air nearly as much as they are on the ground. Once you get into the rythm of accelerating through the deep compression bottom turns and airing off the top of the next mogul you can't help but to have a huge grin on your face. I assembled a handful of clips in an attempt to share the experience of riding the Allegrippis trails. This video will give you an idea of what it's like to ride the trails but it doesn't compare to riding it for yourself."